There are two types of hypertension: arterial hypertension and venous hypertension. People are usually diagnosed arterial hypertension. The alternative definition of «arterial hypertension» is high blood pressure. To understand what hypertension is, first we need to know what blood pressure is. The blood pressure is a pressure of blood to the arterial walls, measured in millimeters of mercury (mmHg). To determine the blood pressure level, you need to measure the pressure of blood to the vessel walls during the contraction and relaxation of the heart. «What is hypertension?» is the most frequently asked, yet not the only popular question about the blood pressure. 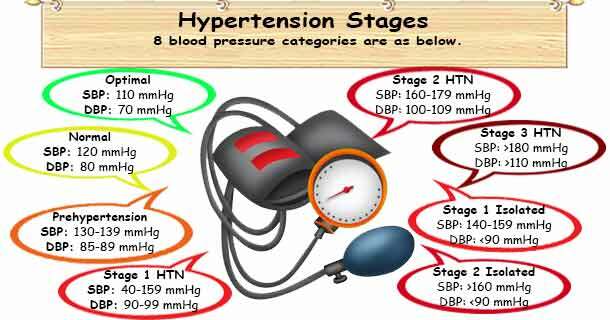 Many people would like to know the hypertension stages, not what it is. If the blood pressure is slightly different from normal range, prehypertension is diagnosed. If the blood pressure values greatly exceed the norm, Stage 1 or Stage 2 hypertension is diagnosed. If the blood pressure varies from 120/80 to 139/89 mmHg all the time, a prehypertension is diagnosed. If man has no other disorders except for prehypertension, a compulsory drug treatment is not required. However, in order to reduce the risk of hypertension, the doctor can give some recommendations to help a patient to greatly reduce the cardiovascular risks. What is hypertension stage 1? When the blood pressure varies from 140/90 to 159/99 mmHg, hypertension stage 1 is diagnosed. Often, hypertension stage 1 is called moderate hypertension. What is hypertension stage 2? If a regular monitoring of the blood pressure shows indices equal or higher than 160/100 mmHg, hypertension stage 2 is diagnosed. The alternative name of hypertension stage 2 is severe hypertension. Before prescribing the drug and non-drug treatment courses, a doctor should explain his patient what hypertension is, as well as inform him about potential risks that occur if not to treat the disease. Non-drug methods of decrease in the blood pressure may compliment the hypertension drug therapy, or prevent hypertension in patients with normal blood pressure and cardiovascular risk factors. The efficiency of drug and non-drug methods of hypertension treatment in men and women is identical. Special conditions for hypertension treatment are created if woman uses hormonal drugs (like oral contraceptives) or if she is pregnant. When drug therapy of hypertension is carried out along with drug therapy of other diseases, the effect of hypotensive medications either increases or reduces. Therefore, before including a hypotensive medication into the combined therapy, the doctor should estimate its potential interaction with other drugs. If you want to learn more information on hypertension, hypertensive crisis, uncontrolled hypertension or other types of hypertension – ask your questions via email. The answers to frequently asked questions about hypertension will be published in upcoming reviews.